Dow Chemical’s sponsorship of the Olympic stadium, which I’ve been writing about pretty much alone in the UK press since the deal with Locog was done in August, is starting to enter serious political territory. 1. Lib Dem deputy leader Simon Hughes has today signed up to the cross-[arty campaign to force Locog to reconsider its decision. he has added his name to a letter that has been sent to Lord Coe, which I’ll detail below. Tory MP Priti Patel is also on board. 2. Shadow Olympics Minister (& Olympics Board member) Tessa Jowell has stepped up her own rhetoric, a) by writing to the Chair of the Commission for a Sustainable London 2012 to demand disclosure of important tender documents around the deal; and b) asking for a meeting with Dow themselves. 3. Locally, Olympic host borough Tower Hamlets Council is expected to lodge a formal objection with Locog about the deal after a vote next week. Dow also refuses to acknowledge that it has a legal and moral responsibility for the ongoing contamination resulting from Union Carbide’s factory in Bhopal which has led to high quantities of organochlorines and lead in local water supplies. In water contaminated areas, children are born damaged at a rate many times higher than in the rest of India, in some places ten times higher. How ironic it is that so much money has been spent on decontaminating the Olympic site, while so many people suffer from contaminated water as a direct responsibility of Dow. When Dow accepted the award of the Olympic Wrap commission, Keith Wiggins, Dow UK’s Managing Director bragged about Dow’s “strong commitment to sustainability”. This makes a mockery of the word, and is a stain on the ambitions of the Olympics. In no sense does Dow meet the high ‘environmental, social and ethical’ standards demanded by LOCOG’s own Sustainable Sourcing Code and we urge you to think again to protect the Olympic legacy for Britain. MPs – Barry Gardiner MP (Chair of Labour Friends of India), Simon Hughes MP (Deputy Leader of the Liberal Democrats), Rushanara Ali MP (Labour), Zac Goldsmith MP (Conservative), Keith Vaz MP(Labour), Graeme Stringer MP (Labour), Dan Byles MP (Conservative), Bob Blackman MP (Conservative), Andy Love MP (Labour), Priti Patel MP (Conservative), John Robertson MP (Labour), Duncan Hames MP (Liberal Democrat), Julian Huppert MP (Liberal Democrat), Bob Russell MP (Liberal Democrat), Theresa Pearce MP (Labour),Geraint Davies MP (Labour), John McDonnell MP (Labour), Heidi Alexander MP (Labour), Stephen Pound MP (Labour), Jeremy Corbyn MP (Labour), Gareth Thomas MP (Labour), John Cryer MP (Labour), Jim Sheridan MP (Labour), Kate Hoey MP (Labour). Indian Olympians – Aslam Sher Khan (1972, Hockey),Ali Sayeed (1964, Hockey), BP Govinda (1972, Hockey), Inam Ur-Rehman (1968, Hockey), Charles Cornelius (1972, Hockey), M.P. Ganesh (1972, Hockey), Mukhbain Singh (1972, Hockey), VJ Phillips (1972, 1976, Hockey), Ashok Kumar Dhyanchand (1972, 1976, Hockey), Syed Ali (1972, 1976, Hockey), Vasudevan Baskaran (1980, Hockey), Jalaluddin Rizvi (1984, Hockey), Hardeep Singh Grewal (1984, Hockey), Vineet Kumar (1984, Hockey), Balwinder Singh (1988, Hockey), Sujit Kumar (1988, Hockey), Jagbir Singh (1988, 1992, Hockey), Ashwini Nachapa (1988, Track and Field), Gavin Ferreira (1996, Hockey), Dhanraj Pillay (1996,2000, 2004, Hockey), Sameer Daad (2000, Hockey), A.B. Subbaiah (1992, 1996, Hockey). “In light of the public pressure opposing the decision to grant Dow Chemical the tender for the wrap, I wondered whether you might make publicly available the documents and representations you received to determine Dow’s commitment to sustainability in the Olympic Games in 2012? As it is in everyone’s interest that the process of arriving at decisions about sustainability are transparent, I would also be grateful if you could let me know if Commissioners discussed Dow Chemical’s link to the human rights and environmental tragedy in Bhopal and whether any decision was taken in relation to that. 1. The London Olympic Games is intended to be one of the most sustainable, environmentally friendly Games to date. Is Dow’s conduct since acquiring the Union Carbide Corporation in 2001 consistent with the Olympics’ sustainability aims? 2. LOCOG saw legal documents from Dow about their involvement with UCC and Bhopal. Did they seek advice from other groups to balance their judgement? 3. Even if Dow win their legal battles against Bhopal survivors and the Indian Government, is there a reputational risk to London 2012 in their sponsorship of the Olympic Stadium wrap? It’s better that we have an unwrapped Stadium, rather than a Stadium wrapped in the continuing controversy of Dow Chemical’s sponsorship. That on the night of 2/3rd December 1984 at the Union Carbide India Limited (UCIL) pesticide plant in Bhopal, India a chemical leak exposed thousands of people to toxic gas and other harmful materials. That campaign groups estimate that as many as 25,000 people died as a result of the leak and many thousands more were injured. That Dow Chemical purchased Union Carbide Corporation (of which UCIL was a subsidiary) in 2001 and there are ongoing unresolved court and civil cases against them over the disaster. That international Groups such as Amnesty International have been campaigning for Dow to address the outstanding demands for compensation relating to the disaster and its impact, including contamination of water by chemical waste. That this campaign remains ongoing, despite 27 years passing since the events took place. 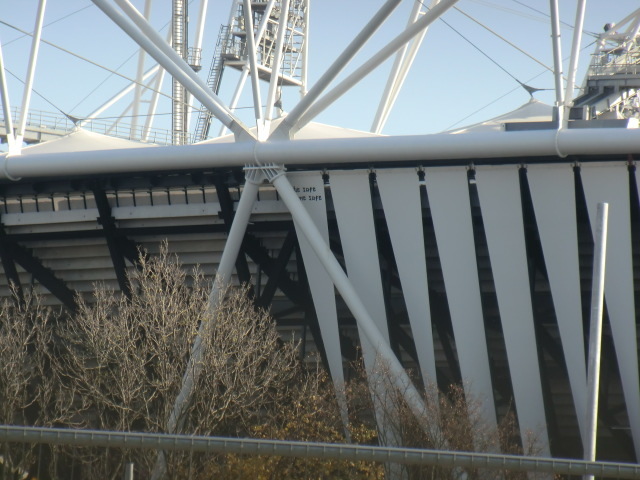 That, in a £7m deal, Dow Chemical has been given a contract for ‘exclusive marketing rights’ to the Olympic Stadium for the London 2012 games and will be branding the ‘wrap’ that surrounds the stadium. That this will guarantee Dow Chemical a prominent profile throughout the games period. That both Shadow Olympics Minister Tessa Jowell MP and Chair of the Home Affairs Select Committee Keith Vaz as well as Amnesty International have expressed their concern over the contract being awarded to Dow whilst there are ongoing human rights and legal cases surrounding the Bhopal disaster. To register our opposition to the involvement of Dow Chemical in the London 2012 Olympic Games. To join the campaign to call for LOCOG to reverse it’s decision to award this marketing contract to Dow Chemical by writing to London 2012 Chairman, Lord Coe, Secretary of State for Culture, Jeremy Hunt MP and LOCOG Chief Executive Officer, Paul Deighton. To work with cross party politicians, campaign groups and others to assist the campaign. There will be further political developments by the end of the week: watch this space.